My favorite season is autumn when the leaves change colors, the air is brisk and there’s still a chance for a bright sunny day with cool evenings. Apples, pumpkins and spice dominate baking and coffees and soups and stews are welcome warm additions to our meals. On my morning walks, the leaves crunch and swirl about, the squirrels are busy hiding acorns, and there’s an urgency to walk faster in order to get back home where there’s a pot of soup waiting to be made. 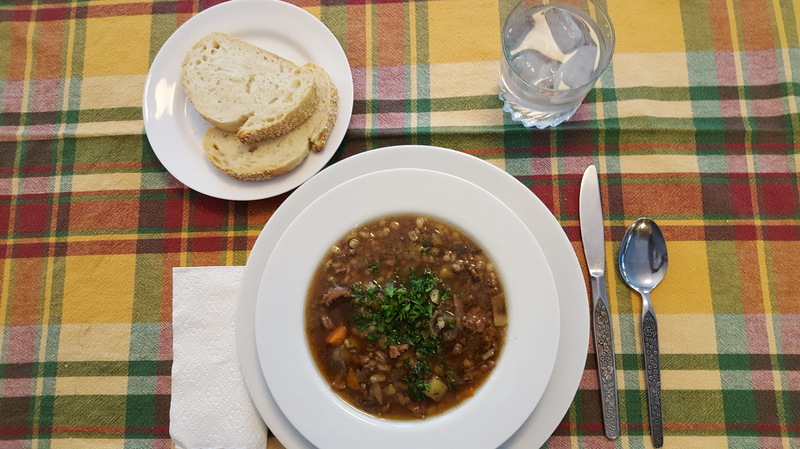 This Beef and Barley soup is one of our favorites and goes together quickly. It can be made with ground beef or with left over sliced beef from Sunday’s roast. My hubby prefers it with the ground beef. In a large stockpot, heat olive oil over medium low heat and add onions, celery and carrots. 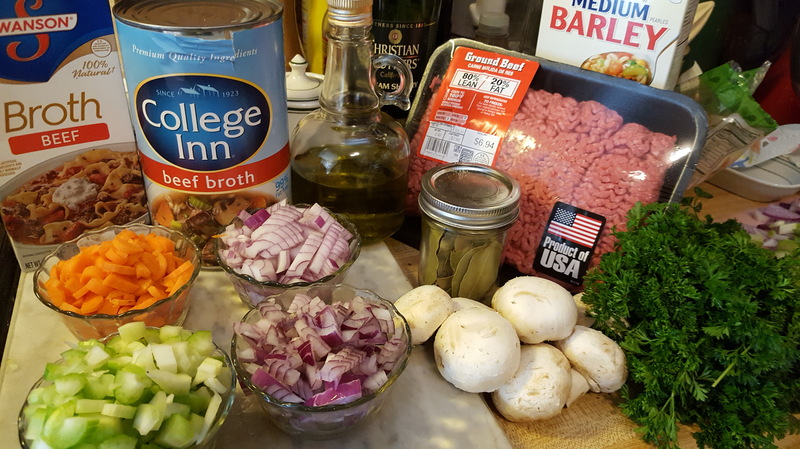 Stir together and cook vegetables to make a mirepoix. Mirepoix (pronunciation is meer-PWAH) uses a very gentle slow cooking process using oil or butter to bring out the best flavors of the vegetables without sautéing. The object is to slowly cook the onions, carrots and celery to sweeten rather than caramelize or brown. The mixture traditionally is 2 parts onion, 1 part celery and 1 part carrot. If I have extra time and feel like a little extra chopping, when making a mirepoix to start a recipe, I usually double or triple the batch. Then I can make two or more kinds of soup or stew or freeze the extras in small quantities for making a quick pot of soup at a later time. It is far more efficient to make a large batch, freeze it in small quantities to make smaller batches of soup more quickly. The again, I sometimes just make several types of soup or stew and freeze the soup in small batches. Just depends on how much freezer space is available. Continue to sweat another 7 to 10 minutes or till vegetables are tender and translucent. Remove mirepoix from pan reserving oil in the pan. In the same stockpot, brown the ground beef over medium high heat. Just before the meat is browned, add the minced garlic and continue browning for another 2 – 3 minutes. Drain most of the oil from sauteing the meat. Then, season with salt and pepper and add chopped mushrooms stirring to combine. Add reserved mirepoix, beef stock and bay leaf, bring to boil, cover, turn heat down and simmer for 30 minutes. You can add more or less beef stock depending on how thin you prefer your soup. 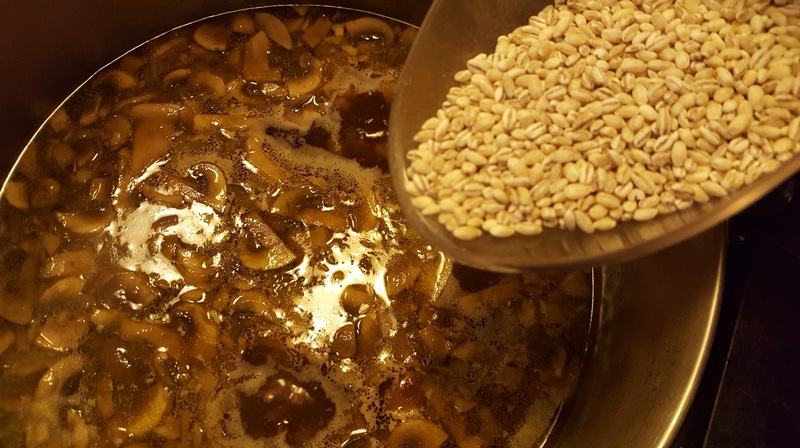 Once mushrooms are thoroughly cooked about 10-15 minutes, add barley and continue simmering for about 30 minutes or till barley is tender. Remove bay leaf and serve. Serve with some crusty bread and a salad. NOTE: If you need to feed a large group, the recipe doubles or triples quite nicely. Just be sure your stock pot is large enough. This soup freezes well so make a large batch and put some away for later. Another way to stretch this soup is to pan roast diced potatoes and add to the soup. Just peel and dice potatoes, toss with a little olive oil, salt and pepper, spread out on a rimmed baking sheet and roast in a 425F degree oven for about 20 minutes or till the potatoes are golden brown. Add to soup, stir and heat through for about 5-7 minutes. Adding the potatoes gives the soup additional flavor and stretches it to feed an additional 2 or 3 people depending on how many potatoes you add. Roasted potatoes hold together better in the soup and give a better flavor.